Just in case you needed some extra Final Fantasy in your life in the form of food and drink, you can now buy a special drink at Kung Fu Tea. 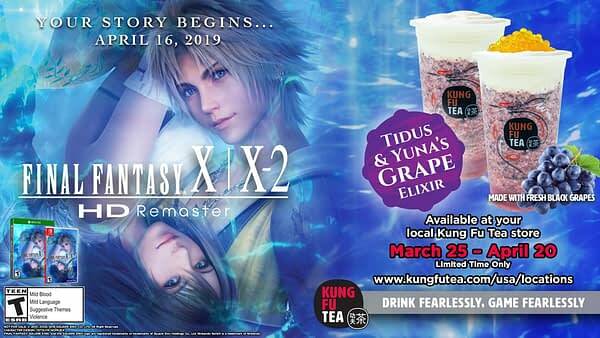 From March 25th until April 20th, the company will be selling a new drink specific to Final Fantasy X/X-2 called Tidus & Yuna’s Grape Elixir. This is all being done as part of the promotion for the HD remastered version being released on Xbox One and Nintendo Switch. Here’s a little more detail on what it will taste like, as well as a special contest for your chance to win special console designed like the game. Fans who purchase the drink will receive an exclusive sticker, featuring the artwork of famed illustrator Nomura Tetsuya, while supplies last. The Final Fantasy X|X-2-themed beverage is a blend of fresh black grapes and berry jam topped with Kung Fu Tea’s best-selling creamy Milk Cap. Fans will also have the opportunity to enter into a daily sweepstakes and an add-on giveaway through Kung Fu Tea’s official social media channels for a chance to win a digital copy of Final Fantasy X/X-2 HD Remaster or a custom-designed Xbox One or Switch console. There’s a Kung Fu Tea nearby a few of our writers, so eventually one of us will head out and buy one to test how it tastes.